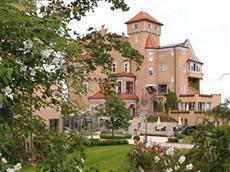 Schloss Monchstein Hotel is awarded by the Star Award as the best 5 star hotel in Austria by the "Austrian Chamber of Commerce" Professional Association of Hotel Industry 2004. The hotel was built in 1948, the Castle was built in 1350. Yousoll find this unique castle of the luxury class over the rooftops of the old town of Salzburg, surrounded by a fabulous 15.000 ms_ wide park with lots of meadows and trees. With lots of love for the details, the necessary accurateness as well as with the due respect referring the tradition of the ancient castle, a comprehensive reconstruction was carried out along with the erection of additional rooms and function rooms. And thus, the beautiful, historically valuable castle let its brightness shine over Salzburg after it has reopened well timed at the beginning of the festival season in July 2003. The hotel in Salzburg offers all basic factors for exceptionally meetings, conferences and events. The hotel is situated in the heart of Salzburg and is easy reachable. Unique is the special ambiance in the historic seminar room, the competent care, the excellent service, the awarded cuisine and especially the generous newly renovated rooms.